​DIFFERENT TRAINS GALLERY, 432 East Howard Avenue no. 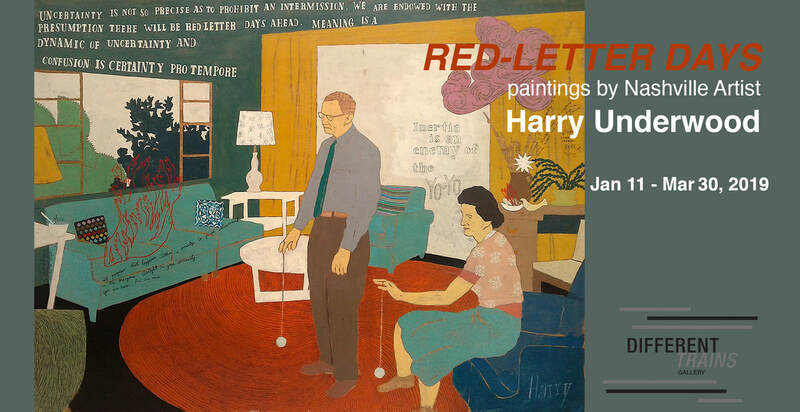 24, presents Red-Letter Days, paintings by Nashville artist Harry Underwood, opening Friday, January 11 and continuing through March 2, 2019. This is the first solo exhibition in Georgia for this contemporary outsider artist who started making art full-time at the age of 35. Harry Underwood was born in Miami, Florida and raised in the nearby rural farming area of Homestead. Displaced by Hurricane Andrew in 1992, he moved to New Orleans and Austin, Texas before settling in Nashville. He worked in the construction industry until 2005, when he made the decision to pursue art full-time. He has exhibited around the US, England and France, and his work has been featured at the Outsider Art Fair in New York City for the past ten consecutive years. Nashville Arts Magazine described Underwood’s work as “a cocktail of realism, surrealism, and pop, of Edward Hopper meets Salvador Dali meets Andy Warhol”. “I know my work is nostalgic”, he says in an interview with the magazine, “but I think I’m looking at it more like I’m imitating advertising, really, and I’m imitating postcard imagery. I’m more of a pop artist.” He uses a soft palette of latex house paint, pencils and varnish on wood panels to create his retro dreamscapes. The colors and compositions draw you in and upon further examination, you read his hand written texts, which can be humorous, ironic or subversive. Harry’s work might remind many viewers, especially here in the South, of the late Reverend Howard Finster (1916-2001) at first glance, but it’s more derivative of Henry Darger (1892-1973), the Chicago artist and writer who worked as a hospital custodian and is now considered to be one of the major figures in Outsider Art. Red-Letter Days opens at DIFFERENT TRAINS GALLERY, in Decatur’s Old Depot District, on Friday, December 11. There will be a reception for the artist from 5 - 8 pm and an artist talk will be scheduled before the show closes on March 2.